The Binding of Isaac: Afterbirth caused quite a stir when it came out in October. It wasn't the DLC itself that caused the uproar, though, but rather the complex ARG it kicked off, which began with what appeared to be a bug that left promised elements of the game inaccessible. Hopefully the launch of the "mini DLC" tentatively entitled Afterbirth+ will go a little more smoothly, or at least make fewer people angry when it rolls out. And yes, Afterbirth+ is actually something that will exist sometime next year. Tyrone Rodriguez of Nicalis made the announcement on the Binding of Isaac blog, although the details were heavily redacted by "Evil Edmund," aka Binding of Isaac creator Edmund McMillen. 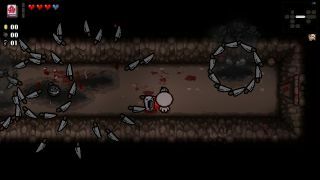 "Afterbirth † will have a bunch of new ***** ********, including a couple of new bosses, a few transformations and new items/trinkets. How many? That’s a ****** you’ll find out on *******," he wrote. "Oh, also, ***** ***** **** and maybe something else related to ***** ****. There’s also a *** ****** I’m leaving out until a later time so you can wonder and conjecture/speculate ***** ****." Got that? Afterbirth+ will also include a Bestiary that will provide detailed information about enemies you've encountered, as well as support for mods, which Rodriguez said is the "big news" in the announcement, and a "user-friendlier" room editor, mod editor, and Lua support. "It’s a lot of changes to the game and I’m really excited to see what all of you make. Thanks for sticking around and being patient while we continue to improve the game," he wrote. "Keep sending your good/bad feedback. We are listening, even if you think we aren’t." A launch date more precise than "next year" was not mentioned.